Explore upcoming arts and culture opportunities across the region. Filter by art form or whether the event has a discount for ARTS Card members. Have an arts event coming up? Submit it to the calendar. 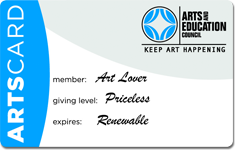 What is an ARTS Card?